With the valuable assistance of skilled team of professionals, we are engaged in offering an extensive range of high-quality Noolappam. Healthy culinary specialty from the south Indian. Idiyappam noodles are also sometimes called string hoppers.Idiyappam is a traditional breakfast of Kerala and Tamil Nadu.Traditional Kerala breakfast made with roasted rice flour and coconut. Idiyappam is usually served with a spicy gravy on the side. We are also providing the chettinad famous 'Idiyappam flour' also known as string hoppers under the name of no.1 brand 'Priyam'. It is known for its great taste and nutritional value. - 30 Secondes cooking time. We offer to our clients our expertise in the field of manufacturing hygienic and nutritious instant idiyappam. 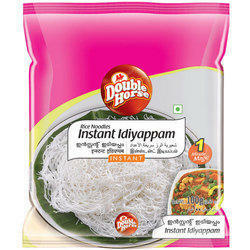 Our ready to eat range of Instant Idiyappam can be cooked very conveniently taking very less time.